There are currently 0 users and 280 guests online. in the future of the past the uploaded consciousnesses of two long-dead world warriors fight for processor cycles inside some sort of christmas computer program??? All was quiet, thanks to your diet. suddenly you had a fright! but the fireplace was not singing. What could it be, but the Chistmas set free? TWO WAYS TO PLAY! 2) Run the Old School For Schools Edition in the zip file to play it- assuming you are on a computer that can understand such old dog tricks! Z) open "STOCKRUEHTML5.html" to the web browser to play the STOCKRUE: DAWN OF CHISTMAS [PRO EDITION]! Features: real time sound play, advanced music orchestration, and a suspicious lack of candy canes. Wrap, rip, plant, send, open, enjoy. The process of gifting. But mysteries lie beneath this surface of seeming simplicity... And who can say what they are? All the people know is that they order their gifts during their given 128 days, and on the dawn of Chistmas they find them under their festive plum pile! Nobody can be displeased at this situation, for signs of displeasure might mean you find your teeth getting inside only coal as you bite into your plump plum pie. But what is in a gift? The real question is what CAN'T be, and lies is what. Only the truth can be found inside a gift - and all the truth is found inside gifts. Be careful what you wish for, because you certainly will get it, like it or not. If you inquire too much into what goes into getting you the truth, maybe this Chistmas in your gift you'll find... yourself! Before you continue, did you know? There are only 128 gifts available. One for each day of Chistmas. It would be wrong for there to be more. Clearly, the penguins don't do the work around here. They just make sure it happens. Nobody knows how, but it is likely that the penguins keep it this way. Some say that we are just creating a mass projection conciousness towards the penguins and our psychic bonds and need to believe in something (anything) so badly have created an otherworldly force - or farce. Some people also say the moon is made out of penguins and that they will come down to collect for their loan to us, in the only way they know how: through the beak. Whatever horse you hold on to to get a pick of your precious plums, the penguins are here and they are part of Chistmas. Trying to challenege this is an affront to the well-meaning Chistmas spirit inside every penguin - and maybe every person too! Hold on, did that penguin just say something to CANDELBRA CANNY? Or - to you? Does the difference really matter? BRR! BRR! BRR! BRR! BRR!! BRR! BRR! BRR! BRR! BRR!! BRR! BRR! B-R! BRR! BRR!! BRR! BRR! BRR! BRR! BRR!! BRR! BRR! BRR! BRR! BRR!! BRR! BRR! BR-! BRR! BRR!! -RR! BRR! BRR! BRR! BRR!! BRR! BRR! BRR! BRR! BRR-! Take over their role, the flame of the spirit of Chistmas. It is up to them (you!) to contain the unruly gifts, as DR. PENG unleashes them into the world (as far as the 3rd NW Pole is the world). It is up to their abilities - namely, demanding more rights (recieved in the form of more gifts to wrap mostly), transmogrifying the self (but not the spirit) into a candy cane with nice blue highlights, as well as summoning another CANNY from another timeline (when the boss DR. PENG is not looking). CANNY is likely the only living gift wrapper today, so they have a lot of work cut out for them! Penguins roam the gardens in the distance, restricted access to visitors. Not that there have been any since... about 576 Chistmas times past. There were penguins here before anything else, and eventually everything will be only pengins. Nothing but penguins, and just the penguins. Even DR. PENG must face that they will be overrun by their farm of penguins sooner or later. The penguins say they hold many mysteries, past and passed down their descendents for spans of time that cannot be understood by any mortal. But on top of the other flipper, nobody can communicate with the penguins, and it is rumoured that even the self-proclaimed/named & cool cat DR. - PENG is unable to do so! So how can we know for sure that we have any thing about them written down that is true, in the slightest? Absolutely not. But there's more to the NW3P than the penguins that cover every possible inch visible from the sky, or even space. Those gifts have to be wrapped up somewhere - all 128 of them! Who better to do it, than the penguins? Oh! But of course, they are all in managerial positions. Such is deserved of their old nature. We all know every thing capable of true thought naturally leads to an agressive, nasty, brutish, capitalist society. Day 1: Get out the lists. Day 2: Get out the pens. Day 68: CANDELBRA CANNY begins wrap-ing. Day 7-: Supervisor Inspection #1. Day 91: Supervisor Ins-ection #7. Day 1-7: Supervisor Inspection #14. Day 108: Breach contained. No errors de-ected. Day 109: Gift wrapping resumes at the Pole. Day 110: Supervisor Inspection #15. Day 111: Supervisors #6 through #14 found missing. Day 112: Hurry up with the wrapping! Day 113: Hurry up with the wrapping! -ay 114: Hurry up with the wrap-ing! Day 120: Supervisor Inspection #16. Day 121: CANDELBRA CANNY will face demerit for insufficient wrapping. Da- 128: The tr-e meaning of -histmas is found! 0-1: How did you even wrap this few? How is that possible? 2-10: The ROYAL APPLE FAMILY will be glad to have your gifts. Nobody else is getting any. 12-40: Pretty good, but DR. PENG has made off with most of the GIFTS for himself and his penguin collection! 42-70: Great work! But not great enough! Your pay is being demarked 55% (on top of the 65% paycut for working overtime on holiday hours). 72-100: You're awesome! But not awesome enough! Your pay is being demarked 45% (on top of the 75% paycut for failing an attempt of success). 102-126: Please, don't talk to me. You clearly have aptitude, but you are not enough. Your replacement will be here soon. 128-128: Right on! You did it! You got it, CANNY! How.... - uncanned of you. Yes. How dare you presume you could make it this far... You must do better than that to truly appease such as me. 130+: You got more GIFTS than there were in the whole world in the first place! How did you do that? Why did you do that?? Why have you brought a collapse on the future of the universe upon us with your tampering? I reskinned an Astrosmash example I made a while back. You're now blowing up XMas ornaments instead of asteroids, and shooting Santa/Elf/Mrs. Claus Heads instead of UFOs. Use the ARROW KEYS to move your Orna-woman LEFT or RIGHT. Throw candy with the SHIFT KEY. Press UP to toggle autofire mode. Press and hold DOWN to activate your Snowglobe Shield. This blocks everything, but has a limited battery. It will slowly recharge over time. 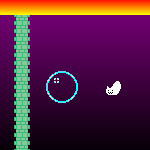 There are also powerups that let you throw more candy or move back and forth faster. You gave me some difficult criteria! Like, "not stupid"! And "Depth"! Those are things I don't normally attempt, but this game turned out really good anyway! Sound effects courtesy of my son Eric, age 6. He insisted. I finished this game like a week or two ago but I've been stuck on deciding what music to put in, and finally I decided that you should listen to your own music while you play. It's a feature! wuuurrlllll, it's thee thought that counts...? klikmas secret santa for lilinx.com~ merry xmas! Holy terrible scanline implementation, Batman! I have not played Death Race but I got a pretty good idea of it reading Dessgeega's blog. Deck the halls with people doing their Christmas shopping in a built-up urban area or compete in the deadly DEATHRENA for imaginary fun and prizes.